Rapid molecular identification and typing of micro-organisms is extremely important in efforts to monitor the geographical spread of virulent, epidemic or antibiotic-resistant pathogens. It has become a mainstay of integrated hospital infection control service. In addition, numerous industrial and biotechnological applications require the study of the diversity of organisms. Conventional phenotypic identification and typing methods have long been the mainstay of microbial population and epidemiological studies, but such methods often lack adequate discrimination and their use is normally confined to the group of organisms for which they were originally devised. Molecular fingerprinting methods have flourished in recent years and many of these new methods can be applied to numerous different organisms for a variety of purposes. Standardisation of these methods is vitally important. In addition, the generation of large numbers of complex fingerprint profiles requires that a computer-assisted strategy is used for the formation and analysis of databases. The purpose of this book is to describe the best fingerprinting methods that are currently available and the computer-assisted strategies that can be used for analysis and exchange of data between laboratories. This book is dedicated to the memory of Jan Ursing (1926 - 2000), Swedish microbiologist, taxonomist and philosopher. 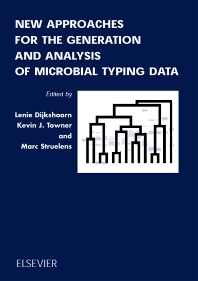 "...taxonomy is on the borders of philosophy because we do not know the natural continuities and discontinuities..."
An introduction to the generation and analysis of microbial typing data (L. Dijkshoorn, K. Towner). Theoretical aspects of pattern analysis (A. van Ooyen). Setting-up intra- and inter-laboratory databases of electrophoretic profiles (H.F. Heersma, K. Kremer, D. van Soolingen, J. Hauman). Fingerprinting of microorganisms by protein and lipopolysaccharide SDS-PAGE (L. Dijkshoorn). rRNA gene restriction pattern determination (ribotyping) and computer interpretation (P.A.D. Grimont, F. Grimont). Generation and analysis of RAPD fingerprinting profiles (K. Towner, H. Grundmann). Analysis of microbial genomic macrorestriction patterns by pulsed-field gel electrophoresis (PFGE) typing (M.J. Struelens, R. De Ryck, A. Deplano). Selective restriction fragment amplification by AFLP™ (P.J.D. Janssen). Application and analysis of ARDRA patterns in bacterial identification, taxonomy and phylogeny (M. Vaneechoutte, M. Heyndrickx). Insertion sequence (IS) typing and oligotyping (N.A. Saunders). Molecular characterisation of microbial communities based on 16S rRNA sequence diversity (E.G. Zoetendal, A.D.L. Akkermans, W.M. de Vos). From multilocus enzyme electrophoresis to multilocus sequence typing (D.A. Caugant). Author index. Keyword index.